I coach women who are stuck in a soul-sucking job and have an entrepreneurial mindset but feel suffocated at work. My mission is to help you grow a meaningful and profitable business. Saloua Ibaline is a certified Life, Business Coach and a Digital Marketing Expert with over a decade of experience in business, sales, and marketing. She works primarily with driven, creative women to help them to start the impactful and profitable business they've always dreamed of. As a business coach, Saloua offers a Business & Marketing Coaching Program for women who are ready to start their own business. This program is perfect for women who feel overwhelmed with thoughts and information, and need a trusted source to enable them to outline an all-inclusive strategy of action to take their business to the next level. Women, who have a vision for their business but need systems and structures in place to get things done efficiently. As a business coach, she is extraordinarily committed to helping her clients unlock their potential and providing the tools they need to succeed. 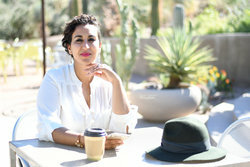 Saloua helps and guides her clients in developing their business by helping them clarify their vision and how it impacts their personal goals. Her mission is to motivate her clients to keep their commitments while helping them remain concentrated on the outcomes and why it is essential to them. After working for Google Adwords, she decided to open her own agency - Ibaline Media where she consults, speaks and works with companies around the globe. Saloua empowers her clients to grow their digital media presence so they can grow their brand and build a successful online business. Additionally, Saloua runs a women empowerment movement called Self Made Successful Women, hosting monthly panels and weekly masterminds. Her mission is to empower, educate and inspire women to use their inner power to grow an impactful and successful business. Have you worked with Saloua? Tell your friends! I have been working with Saloua a few months now and have made significant progress in my building my business as well as in myself. In the beginning, she took time in understanding how I learn and what challenges I face within myself. In doing so, I have a better grasp on what difficulties I experience in my workspace. She is ever encouraging, and in times I doubt myself or problems come up, she always finds a way to help me face and move through it. I am delighted with her coaching, and I recommend her services. I worked with Saloua as a life coach, and gained a lot from the experience. I knew I was unhappy with certain aspects of my life, but Saloua got me to go into much more detail and work out exactly where the problems were, and come up with specific plans to improve. She is dedicated and consistent, and not afraid to go deep with you, if you're willing. I feel like Saloua is always there for me, encouraging and pushing me to be my best self. With her vivacious personality Saloua, creates a welcoming atmosphere of warmth and positive energy at her training workshops. She delivers information to help each of us live a more balanced, rewarding and successful life. Thank you for your mission and passion in developing programs that support people in living their best life. Saloua is so motivating and encouraging! There is no more self-sabotaging when you are around Saloua. She helps you to understand what maybe stopping you from accomplishing your goals and then helps you create a plan to achieve those goals. It is clear that Saloua truly cares about the people she works with and loves to see them find success! Saloua hasn't submitted any articles.